Lakeside boss Will Pottinger admits they were beaten by the better side as they went down 52-38 in their top-of-the-table clash at Peterborough. It was a first defeat in eight for the Hammers who also failed to pick up any points for their efforts for only the second time this season. The Purfleet outfit were able to keep the hosts on their toes in the early stages before a Heat Five maximum saw Peterborough open up a six-point lead. Pottinger nominated captain Richard Lawson as a tactical substitute in the sixth who went out and took the chequered flag in one of only two heat advantages on the night for the Hammers. 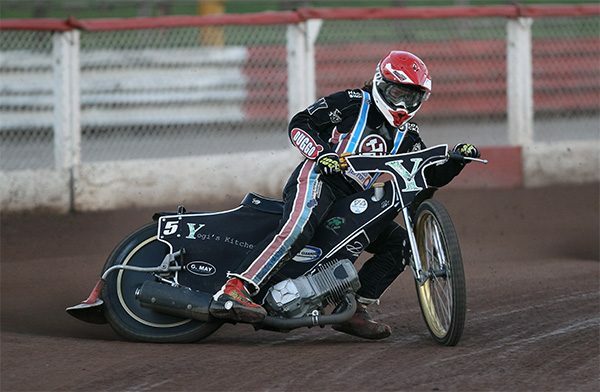 But Peterborough came on strong registering five race results in their favour in the space of six heats to stamp their authority on the fixture. It proved to be a tough night overall for the Hammers, particularly without injured middle-order man Kyle Newman. Lawson managed 15 points from his maximum allowance of seven rides while he was supported well by Adam Ellis who had another solid night at No.3. No.1 Nick Morris endured a rare off night while Zach Wajtknecht experienced an up and down fixture on his return from international duty. Alfie Bowtell struggled down at reserve as did Ben Morley who was withdrawn from the meeting after his fourth ride after he aggravated a thumb injury which initially made him a doubt for the meeting. And while boss Pottinger was disappointed, he was also keen to reiterate that there’s still a long way to go in the campaign. He said: “Congratulations to Peterborough , they were the better team on the night and it’s as simple as that. “We had too long a tail towards the lower end and we obviously know Nick is capable of much better than what he did. I think we missed Kyle a bit because running rider replacement at that position when your reserves are struggling is tough. The Hammers compete in the Championship Fours Tournament at Redcar on Sunday (2pm) before back-to-back fixtures against Glasgow. They travel to Scotland next Friday (July 6, 7.30) before hosting the Tigers at the Arena-Essex Raceway on Saturday, July 7 (7.45). Ulrich Ostergaard 12, Bradley Wilson-Dean 11, Scott Nicholls 9, Michael Palm Toft 7+3, Simon Lambert 6+2, Tom Bacon 5, Ellis Perks 2+1. Richard Lawson 15, Adam Ellis 11, Nick Morris 5+1, Zach Wajtknecht 4, Ben Morley 2, Alfie Bowtell 1+1, Kyle Newman R/R.